Preheat the oven to 400 degrees. Grease and line with paper a 15 1/2 x 10 1/2 x 1 inch jelly roll pan. Beat the egg yolks and the 3/4 cup of sugar until light. Sift together the flour, cocoa and baking soda. Add to the egg yolks and beat until smooth and well blended, then add the hot water. Whip the egg whites, add the 1/4 cup sugar and beat until stiff, but not dry. Pour into the prepared pan; make sure the batter in the pan is evenly spread out. Bake until the cake leaves the side of the pan (check at about 15 minutes). While hot, turn out onto a dry cloth which has been lightly coated with powdered sugar (a clean dish towel is good for this). Roll it up gently. 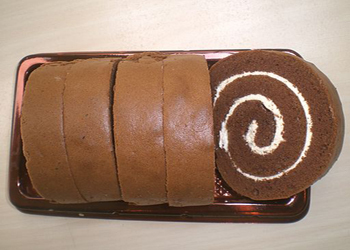 Unroll, spread the whipped cream on the cake and re-roll.